Today’s taks is: Write about your favourite knitting or crochet (or spinning, etc) tool. It can either be a tool directly involved in your craft (knitting needles or crochet hook) or something that makes your craft more pleasurable – be it a special lamp, or stitch markers. Saying that I’m off to my pretty balcony. Though it is quite cold today, compared to the last days when it was near summerish, I need to do some things. And my to do list for the weekend lists quite a few other things, like doing the laundry, finally finish to sew my dress that I cut in autumn and planning my blog posts for May. This entry was posted in Knitting & Crocheting and tagged 4KCBWDAY6, Knitting, Knitting & Crochet Blog Week IV 2013 by kathatravelling. Bookmark the permalink. I have Knit Pro and Knitter’s Pride and will never go back to fixed needles. I do have fixed in sizes that don’t come in IN version. But much prefer the IN to anything else. I keep some fixed needles too. They are sometimes handy to stitch parts together to try them on. 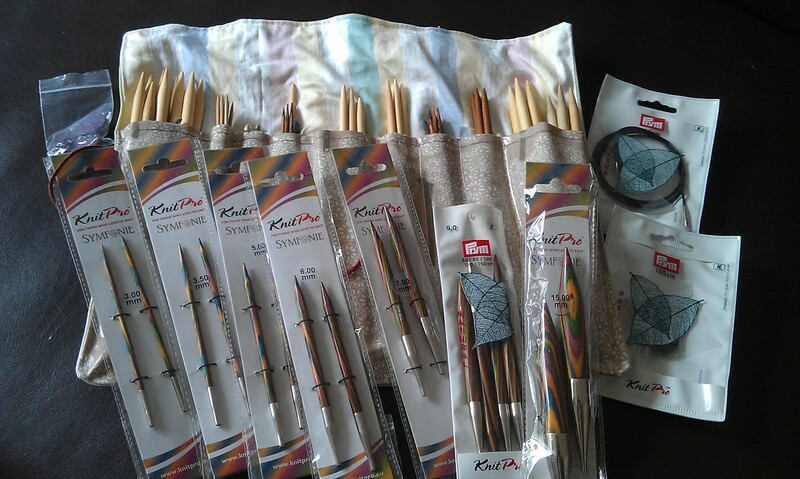 I have a few sets of small gauge wooden needles for socks. I like the way they feel in my hand but in the past my dogs have found them more “interesting” than metal needles so sadly I have taken to buying only metal needles.